Pennsylvania voters have suddenly found themselves triple whammied. On the same day Judge Robert E. Simpson released his baffling 70 page ruling on the validity of Pennsylvania's new voter ID law, the Department of State quietly issued an email to county election officials explaining that it would drop two initiatives intended to boost voting. The initiatives would have allowed citizens to register to vote online and to apply online for absentee ballots for the upcoming election. The reasons, according to an unidentified Department of State spokesperson and Department of State Commissioner, Jonathan Marks: it's too much work! All efforts and resources, it seems, are focused on implementing the new voter ID law. The Philadelphia Inquirer reports today that after the Commonwealth Court ruled in favor of the state's strict voter-ID law—a law many believe will result in fewer people being able to vote—Corbett's administration opted to abandon two different efforts intended to boost the vote. The state will no longer try to make online voter registration available this year, nor can those who need to vote absentee submit their applications online. That's a big deal. Pennsylvania doesn't just allow anyone to vote absentee; you have to show proof that you cannot be at the polls for one of the acceptable reasons. Without the online option, those needing an absentee ballot will have to either mail in their application or deliver it in person. Meanwhile, online registration simply streamlines the process, creating less paperwork and requiring less effort for the would-be voter. According to the Pennsylvania Department of State, it's too much work to implement both the voter-ID law and these new reforms. Let's just be clear on the situation here. These online systems make it easier to vote. Pennsylvania is not going to pursue those, because its hands are full with the voter ID-law that makes it harder to vote. The law, which requires voters to show a government-issued identification is among the strictest in the country; to get an ID in the Keystone state is no easy feat: It requires a birth certificate, Social Security card, as well as two proofs of address. The state's inability to create these online systems casts doubt on just how able it will be to implement the more-complex voter-ID law. In his ruling on the constitutionality of the law, Judge Robert Simpson, who refused Wednesday to grant an injunction, argued the law would not inevitably disenfranchise voters because of the state's plan to introduce a new "card of last resort" for those who lack the documentation to get a standard ID. For those too frail or ill to get a card, Simpson said absentee voting should be available. State officials promised the new card would be ready by the end of August, while attorneys opposing the law pointed out there was no guarantee that deadline would be met. Simpson sided with what he called the "believable testimony" of the state (the lawsuit is now headed to the state Supreme Court). But if the state cannot get the online systems up and running—something that they initially planned to have ready at the beginning of July—how much more difficult will it be to have the complicated new ID card ready in the next couple weeks? Without the card of last resort, those who cannot obtain a birth certificate or who have issues with name changes and other complications may not be able to vote. The Justice Department is currently investigating voter ID laws in Pennsylvania, South Carolina and Texas. Pennsylvania state elections officials have until the end of the month to send detailed documents to the Justice Department that relate to the law and it's implementation. Of course, any actions taken by the Justice Department may not come in time to help voters in the November election. Voter ID laws have been enacted in 33 states, with three states that require pre-clearance under Section 5 of the Voting Rights Act pending enactment. The majority of these laws allow voters to present a variety of non-government issued documents as proof of identity at the polls, including a current utility bill, student ID, recorder's certificate, current bank statement or paycheck, among others. However, Pennsylvania is one of 13 states that will enact or have enacted voter ID laws with strict government issued identification requirements. (See table 2 on link page for voter requirements listed for every state and interactive map). 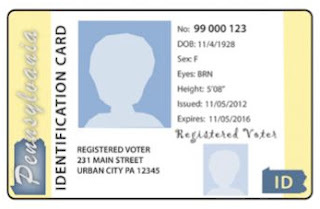 In this report, the Pennsylvania Budget and Policy Center (PBPC) has documented the experience that voters would have when seeking to obtain an ID through the Pennsylvania Department of Transportation (PennDOT), the agency responsible for issuing the free ID. PBPC recruited volunteers who made 47 visits to 43 PennDOT offices in 28 counties to observe how the law was being implemented. The 43 offices in our sample are representative of the geographical distribution of all PennDOT offices issuing non-driver photo ID and serve 73% of Pennsylvania’s population. Volunteers were asked to observe if signage was visible, if documents necessary to obtain a free ID were readily available, and if the staff they encountered were familiar with the request for an ID and able to direct them appropriately. Since access to a free ID is critical to the constitutionality of the law, we asked voters to indicate if PennDOT staff volunteered information that an ID could be obtained for free. We also looked at the location and hours of operation of PennDOT driver’s license centers, which are the primary point of contact for most voters. In only 13% of observations was there signage in the reception area indicating a voter ID could be obtained. In almost half the visits, neither signs nor written information was observed. While most PennDOT staff encountered by our volunteers were familiar with the request for voter ID, in nearly half the visits individuals were given incomplete or inaccurate information. Few PennDOT staff volunteered that a voter ID could be acquired for free, and in three in 10 cases, volunteers were told incorrectly that they would have to pay. The standard form for obtaining a non-photo ID does not indicate that it is available for free to certain voters, and a second form required to get the ID was not readily available. The number and hours of operation of PennDOT offices are quite limited. There are 71 driver’s license centers in all of Pennsylvania, and nine counties do not have any centers at all. In an additional 20 counties, the driver’s license center is open three days a week or less. One in five volunteers had to return a second time because the Driver License center or Photo License center was closed. Recent reports from the Department of State indicate that many more individuals may lack appropriate ID than initially expected and most will have to turn to PennDOT to secure an ID – whether it is a standard non-driver ID or a new Department of State voter ID that will be available in late August. In either case, it is incumbent on both agencies to ensure the process works smoothly. Based on the observations of our volunteers, currently it does not. Pennsylvania’s voter ID law is restrictive and complicated to implement for Pennsylvania’s large population in such a short period of time. The process to secure identification is not well established, having undergone numerous changes in the four months since the law was enacted. It is at this time unclear whether the Commonwealth has the ability to ensure ID is available to all who need it by the November election. Given the consequence – disenfranchising Pennsylvania voters – the Commonwealth should consider delaying the law until its procedures are more firmly established and its processes improve. To make voter identification more readily available, the Commonwealth should expand the number of sites where voting ID can be obtained, provide mobile ID units for voters who lack transportation, provide clear, uniform information across all sites, improve signage and implement training of staff responsible for issuing ID. If the implementation of this law falls short, the consequences are significant – the disenfranchising of a larger number of Pennsylvania voters. In light of that, the Commonwealth should consider delaying the law until its procedures are more firmly established and its processes improve. Change the DL-54A to clearly state that individuals applying for ID for voting purposes can obtain it for free. Expand hours of operation so appropriate ID can be obtained five days a week at all locations. Provide clear signage and informational material indicating that ID can be obtained and is available for free, and ensure all information is available in multiple languages. Ensure that all appropriate forms are readily available and uniformly issued to those seeking an ID for voting purposes. Publish weekly statistics on the number of photo IDs issued to individuals 17 and over at all locations and the number of free IDs issued. Institute rigorous training for PennDOT workers to ensure familiarity with procedures and understand their role in protecting Pennsylvanians right to vote.